* Eight were tied or within one goal entering the third period (BOS-BUF, WPG-NJD, CHI-OTT, PHI-TBL, ARI-FLA, ANA-STL, SJS-MIN, MTL-VAN). * Seven resulted in one-goal margins, including five that required extra time (BOS-BUF, WPG-NJD, CHI-OTT, SJS-MIN, MTL-VAN). * Seven featured a tying or winning-goal in the final 10 minutes of regulation (BOS-BUF, WPG-NJD, CHI-OTT, PHI-TBL, ARI-FLA, SJS-MIN, MTL-VAN). * Five teams overcame deficits at some point in the game to earn victories; three teams rallied in the third period (BOS, NJD, MIN). * Down 3-1 in the third period, Kyle Brodziak (WATCH ) extended the game with his first two goals of the season before Jason Pominville scored his seventh game-deciding goal in the shootout to give the Minnesota Wild a 4-3 win against the San Jose Sharks. According to the Elias Sports Bureau, Minnesota has won back-to-back games in which it faced a multiple-goal deficit in the third period for the first time in franchise history – the Wild also erased a 3-1 deficit with three unanswered goals in the final period at the Boston Bruins on Tuesday. * The Wild are 7-0-0 in their last seven home games against the Sharks, compared with a 1-8-1 mark in their past 10 games in San Jose. Minnesota (4-0-0 at Xcel Energy Center) is one of two teams yet to lose on home ice (the Montreal Canadiens are also 4-0-0). * Mikko Koivu (1-0—1) scored his 37th career shootout goal (37-for-85, 43.5 percent) to tie teammate Zach Parise and Florida Panthers forward Brad Boyes for the all-time lead among active players. * The Boston Bruins trailed 2-1 with less than six minutes remaining in regulation, but Brad Marchand (2-1—3) forced extra time and then scored the overtime winner (WATCH ) to rally the Bruins past the Buffalo Sabres. According to the Elias Sports Bureau, Marchand is the first Bruins player to tie a game in the final six minutes of regulation and score in overtime since Sergei Samsonov on Jan. 27, 2001 against the New Jersey Devils. He is the fifth Boston player to have three points in a game this season; all five have done it within the past five games: Seth Griffith (2-1—3) on Oct. 28 vs. Minnesota; Dougie Hamilton (1-2—3) on Oct. 25 at the Toronto Maple leafs; Milan Lucic (0-3—3) and Torey Krug (1-2—3) on Oct. 21 against the Sharks. * The Devils trailed 1-0 with less than four minutes left in regulation, but Michael Ryder scored the tying goal and Jacob Josefson (WATCH ) potted the lone shootout tally to lift New Jersey to a 2-1 win against the Winnipeg Jets. It was New Jersey’s first shootout win since March 10, 2013, also against Winnipeg, and snapped an NHL-record 18-game losing streak in tiebreakers; in that game, Patrik Elias scored the only shootout goal to give the Devils a 3-2 win. * The Chicago Blackhawks overcame a 3-2 deficit in the third period on goals by Jonathan Toews (2-0—2) and Marian Hossa (1-1—2) before the Ottawa Senators forced extra time. Chicago's Patrick Sharp scored the lone shootout goal to lift the Blackhawks past the Senators for the second time this week (the Blackhawks won 2-1 at Chicago on Oct. 26). 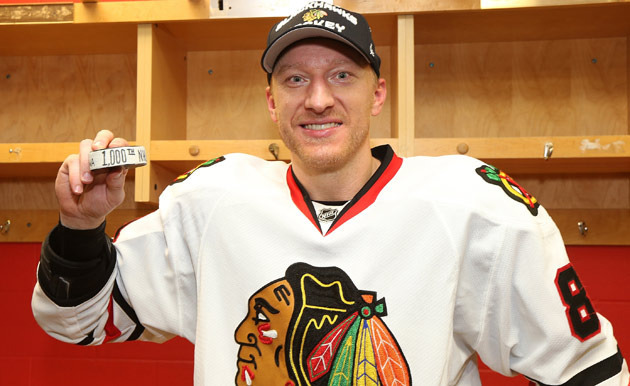 Hossa’s goal was the 1,000th point of his NHL career (WATCH ), making him the fourth active player and 80th in NHL history to reach the milestone. He has 466-534—1,000 in 1,100 career games. * Brandon Pirri erased a 1-0 deficit with his second-period goal and Scottie Upshall scored the game-winner (WATCH ) with 9:04 left in regulation to help the Florida Panthers beat the Arizona Coyotes 2-1 and improve to 3-0-2 in their past five games. The win avenged a 2-1 overtime loss in Glendale, Ariz., on Saturday. Florida goaltender Roberto Luongo stopped 71 of 74 shots in the two games, including (32 on Thursday). The Panthers won in regulation at home against the Coyotes for the first time since Feb. 10, 2007 (1-4-2 in that span). After leading 2-0 with less than eight minutes left in regulation, the Vancouver Canucks surrendered two goals in a span of 5:16 before Daniel Sedin scored in overtime (WATCH ) to lift Vancouver to its third consecutive victory. The win was the club’s first against the Canadiens at Rogers Arena since Oct. 7, 2009 (0-3-0). * Henrik Sedin assisted on his brother’s overtime goal to extend his point streak to six games (2-4—6). The Sedins share the team scoring lead with 12 points (Henrik: 4-8—12; Daniel: 3-9—12). * Ryan Miller stopped 23 of 25 shots and is 7-1-0 with a 2.27 goals-against average and a .917 save percentage with one shutout in his first season with the Canucks. Marc-Andre Fleury turned aside all 35 shots he faced and Chris Kunitz (2-1—3) was involved in all three goals as the Pittsburgh Penguins defeated the Los Angeles Kings 3-0 to improve to 3-0-1 in their past four games. * Fleury is 6-2-0 this season with a .926 save percentage and two shutouts, both of which have come in his past three games (he made 25 saves in a 3-0 road victory against the Nashville Predators on Oct. 25). Fleury’s 30th NHL regular-season shutout came on the 11-year anniversary of his first one, a 1-0 win at Chicago on Oct. 30, 2003, in which he made 20 saves. * Kunitz scored the opening and closing goals for his first multiple-goal game since March 10 at the Washington Capitals. The three-point game was his first since he had a goal and two assists on Jan. 23 at the New York Islanders. Kunitz leads the Penguins with two game-winning goals; he led the team with a career-high eight game-winners last season. * Sidney Crosby (3-3—6) and Patric Hornqvist (1-3—4) each had an assist to extend their point streaks to three games. Crosby (7-8—15) is tied with Dallas’ Tyler Seguin (7-8—15) and Philadelphia’s Jakub Voracek (3-12—15) for the League scoring lead. * Pittsburgh improved to 7-2-0 in its past nine meetings against Los Angeles. The regulation loss halted Los Angeles’ point streak at eight games (6-0-2). * Semyon Varlamov (40 saves) had his first shutout of the season and Nathan MacKinnon scored his first two goals to power the Colorado Avalanche to a 5-0 win against the Islanders. According to the Elias Sports Bureau, Varlamov’s 40 saves are a personal best in a shutout, surpassing his previous high of 34 set on March 30, 2013 against Nashville. Varlamov made at least 40 saves in consecutive games for the first time in his career; he stopped 49 shots on Oct. 28 in a 3-2 shootout loss to San Jose..
* Jake Allen made 24 saves for his second NHL shutout and Alexander Steen’s first-period goal stood as the game-winner as the St. Louis Blues defeated the Anaheim Ducks 2-0 for their third straight win. Steen leads the Blues with two game-winning goals this season after leading the team with a career-high nine in 2013-14. Ryan Reaves, playing his ninth game of the season, scored his second goal, matching his total for 63 games last season. Steven Stamkos (2-1—3) had three points (WATCH ) for the third time this season and Valtteri Filppula (0-3—3) matched a career-high with three assists (four times; last: March 13, 2014 vs. Florida) to power the Tampa Bay Lightning to a 4-3 win against the Philadelphia Flyers. Tampa Bay is 8-0-1 against the Flyers at Amalie Arena since the start of 2010-11. * Jason Garrison (1-1—2) had his first goal and multiple-point game with the Lightning. His power-play goal stood as his 10th career game-winner and his first with the Lightning. Before Thursday, his most recent winning goal came Nov. 28, 2013, at Ottawa while he played for Vancouver. * Anton Stralman extended his point streak to three games (1-3—4) and finished with plus-2. He leads all defensemen and ranks third overall at plus-11. Flyers forward Jakub Voracek posted his fourth consecutive multiple-point game (1-7—8). He shares the League with 15 points and is tops with 12 assists. Teammate Claude Giroux also stretched his point streak to four games (0-6—6); he shares second place in assists with 11. . . . Colorado's Cody McLeod (1-1—2) scored his fifth career game-winning goal and first since Oct. 1, 2009 (vs. San Jose). He also equaled a career-high with two points (9 times, last: April 15, 2013 vs. the Columbus Blue Jackets). In addition to MacKinnon and McLeod, Erik Johnson (1-1—2), Matt Duchene (0-2—2) and Max Talbot (0-2—2) also had multiple-point games for the Avalanche. . . . San Jose’s Brent Burns (0-1—1) stretched his point streak to six games; he leads all defensemen and is tied for fourth overall with 13 points (4-9—13). . . . Ottawa’s Alex Chiasson extended his point streak to four games (2-2—4) . . . Boston’s Loui Eriksson (162-238—400) and Dennis Seidenberg (35-165—200) each reached career point milestones . . . Islanders forward Kyle Okposo played in his 400th NHL game . . . San Jose’s Barclay Goodrow made his NHL debut and teammate Mirco Mueller scored his first NHL goal. Boston’s Joe Morrow also played his first career game . . . The Penguins and Senators wore special jerseys for warmups as part of their Hockey Fights Cancer Nights. 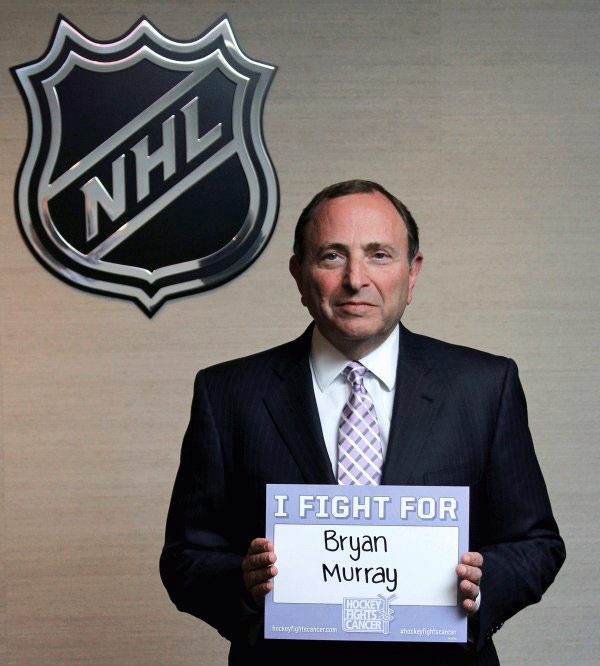 NHL Commissioner Gary Bettman also showed his support of the initiative and for Senators general manager Bryan Murray, who was diagnosed with cancer earlier this year (photo courtesy of Ottawa Senators Foundation).